Thigh reduction surgery performed at NorthEast Plastic Surgery’s Melbourne practice can be helpful to patients who have excess inner thigh skin. The procedure involves the removal of skin and fatty tissue to make the thighs appear more toned. The surgery can address excess skin which may be unsightly and can result in skin irritation, infections and issues with hygiene. Excess skin may be caused by weight loss following bariatric surgery, diet and exercise or following pregnancy. A patient will see best results from thigh reduction surgery when their weight is consistent with a body mass index in the ‘normal’ range and has been for three months. the extent of excess skin. At the consultation, the surgeon will ask you about your medical history. It is important that you disclose any material information concerning previous surgeries, a history of scarring, a tendency for bruising, a tendency for excessive bleeding, deep venous clots involving the legs, all prescription and non-prescription medication, allergies to anaesthetic agents, antibiotics and dressings and any history of smoking and psychological or psychiatric issues. At the consultation, the surgeon will advise you of a number of measures to be taken to minimise the risk and complications of a thigh reduction procedure. It may be necessary to stop taking the Oral Contraceptive Pill before surgery. It is important to avoid Aspirin, Disprin and non-steroidal anti-inflammatory medication such as Nurofen in addition to herbal medications such as Garlic, Ginseng, Ginko, Arnica and Fish and Krill oils two weeks prior to and after surgery. It is essential that smoking cease six weeks prior to and after surgery to minimise the risk of surgical wound complications and anaesthesia. Nicotine containing products can also affect wound healing and should be ceased two weeks prior to and after surgery. If necessary, further medical consultation may be necessary to minimise risk and complications, including consultation regarding blood thinning agents which may need to be either ceased or modified in preparation for surgery. Blood tests may also be necessary for the surgeon to obtain a complete assessment of bleeding tendencies and to optimise fitness for general anaesthesia. Risks which are infrequent but common to all operations include problem scarring such as keloid or hypertrophic scar formation, wound complications including infection, wound breakdown, haematoma formation (bleeding) or seroma formation (tissue fluid collection) in addition to the risk of further surgery to address these potential complications. It is only at the culmination of the consultation process, after having the opportunity to have all your questions addressed by the surgeon, should you consent to thigh reduction surgery. The consent process will include a discussion as to the costs of surgery and potential revisional surgery. NorthEast Plastic Surgery can provide approximate costs for thigh reduction surgery by phone on 03 9088 5000 or via enquiry through our website. Once Mr Patrick Tansley or Dr Sugitha Seneviratne have met with you in an initial consultation, they will be able to discuss the full cost of this procedure, and provide you with a personalised quote. An initial consultation with a Surgeon to discuss thigh reduction surgery costs $175 ($225 for weekend consultations). A portion of this cost may be claimed from Medicare if you have a referral from your GP. Incisions are made on the inner thigh from the groin to the knee. A wedge of skin and fat tissue is removed to optimise the contour of the inner thighs. The internal wounds are repaired with dissolving stitches. Drainage tubes are used to drain excess tissue fluid and blood. After surgery, a waterproof dressing and compression garment is applied to minimise soft tissue swelling. 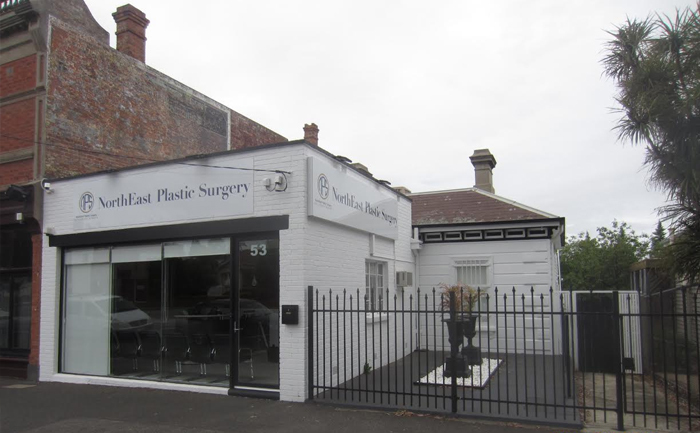 Thigh reduction surgery at NorthEast Plastic Surgery’s Melbourne practice is performed under general anaesthetic administered by a specialist Anaesthetist in an accredited hospital. Prolonged periods of standing are to be avoided but you can walk within your home. It is important that you have access to medical attention by telephone if necessary. Notify your surgeon immediately if you experience the following: temperatures exceeding 38 degrees Celsius, bleeding to the extent that the dressings soak through with blood, pain not controlled by the medication, redness of the thigh or leg skin or any concerns related to the surgery. The inner thigh scar can be unpredictable and will be visible for up to 18 months after surgery. Instructions on low level laser therapy to optimise wound healing, swelling and scar management strategies such as massage, taping and silicone gel sheeting will be provided during post-operative consultations. The final result of thigh reduction surgery may not be fully appreciated until many months after surgery, due to the amount of time it takes for soft tissue swelling to subside. Before and after photos of our previous thigh reduction clients are available to view during your consultation. Out of respect for patient privacy, these images are not available online. Your surgeon will show you several before and after photos during your consultation to assist in your decision-making process.